NOTE: The details and information pertaining to New York ammo laws are meant as a reference point only. As you're likely aware, New York firearm laws change frequently so talk to an attorney or consult your local law enforcement agency before making any final firearms related decisions. New York's SAFE Act makes ammo purchases much more difficult than other states for shooters, which you'll see in detail below. The SAFE Act also bans magazines with capacities greater than 10 rounds. While the SAFE Act tried to prohibit New Yorkers from possessing a magazine loaded with more than seven rounds, a federal appeals court has said that this seven-round limit is unconstitutional. Also, New York prohibits armor-piercing ammunition. Additionally, all federal laws apply across the Empire State. Due to local regulations, Lucky Gunner cannot ship ammo to New York City, Buffalo, or Rochester. 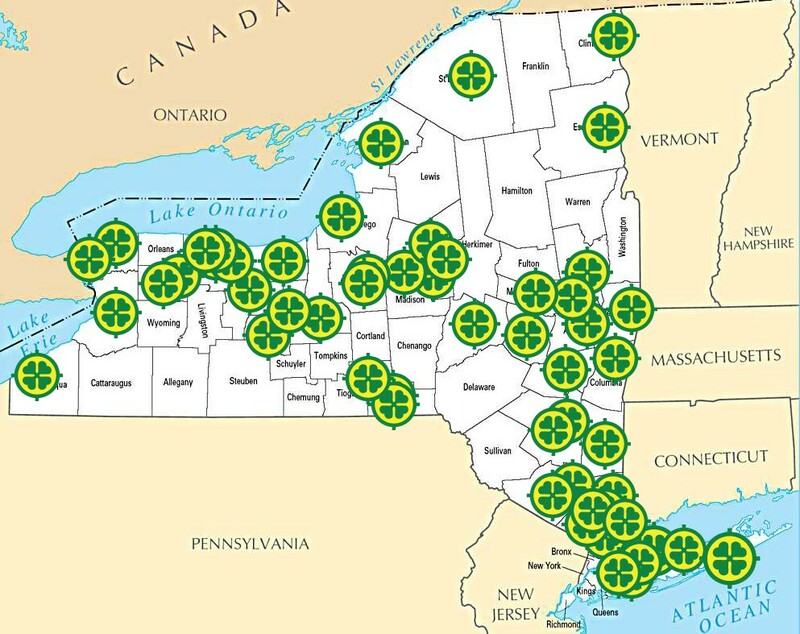 Fortunately, Lucky Gunner is able to ship ammo to the rest of New York State, but we must ship through an Federal Firearms Licensee or what the state calls a "Registered Seller of Ammunition". Use the LuckyGunner.com site as you normally would and proceed to check-out. When you place your order, enter a shipping address as if we could ship directly to you. In other words, enter the location to which we could ideally ship your order, and click Continue. Following this, our system will display two lists. In the first list is all of our Lucky Gunner approved vendors and their transfer fees, listed in distance from you in order of closest to farthest. These are vendors with whom we have worked before and who have agreed to list their transfer fees for our customers. If you choose one of these vendors, your checkout process is complete and you can skip to Step 4 below! 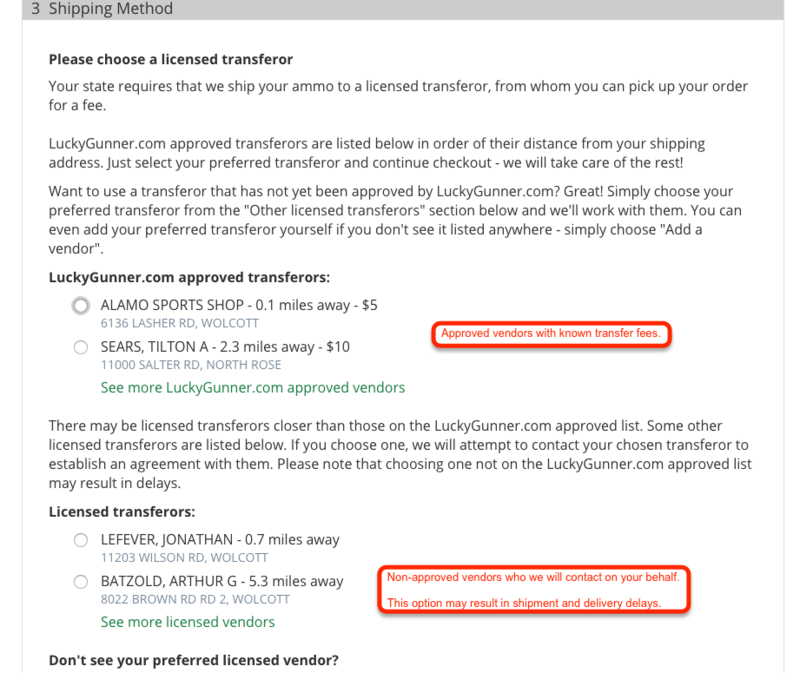 If you choose a non-approved vendor or would like to submit a new vendor, continue to Step 3. If your FFL dealer is not on the approved list, we will need a copy of their license and a completed copy of this transfer agreement. The above link includes a place to upload the license and submit the transfer fee information. Once the dealer has completed those tasks, they’ll be added to our approved list for easy processing in the future for other customers as well so you’ll be doing all New Yorkers a big favor. If you chose an approved dealer or once we have approved your chosen dealer, it is time to ship out your order. We will send your package tracking information the evening that the package ships so that you can track the package to the FFL/Registered Seller of Ammunition of your choosing. We also send an automatic email to your chosen dealer informing them of the coming shipment and also providing them with the tracking number and your phone number and email. We do this so that they can contact you in the event there is an issue or early arrival of the package. Most shipments will arrive in two business days from the date of your order if you order by 3:00 PM (EST). Please plan to pick up your shipment as quickly as possible from when it arrives at the transferring dealer's location so that you can notify us if there are any issues. To see a map of the the FFL and Registered Seller of Ammunition's location, simply click their name in the table below and you'll see a new window pop up with a Google Map that has the details. Yaphank Suffolk Shooting Corporation 70 Horseblock Road, Units 8 and 9 11980 NY 631-775-7111 $10/250rds., Limit 2000rds./mo. Shipping to your FFL from Lucky Gunner is fast to New York. Expect your ammo to get to your FFL 3-4 days from when you place your order! Here's a run-down on all the CCW laws in New York, broken down by municipality. Need to transfer a firearm in New York? Check out our list of FFL dealers above. Here's a current list of the representatives from New York to the U.S. House of Representatives and U.S. Senate. These people vote on federal judges who directly impact your 2A rights! Also, here is a list of your statewide officer holders. These are the folks who vote on issues like the SAFE Act that can make buying ammunition much more difficult and time consuming for responsible gun owners like yourself. Here are the state-level legislative officials in Albany that can play a huge role in your 2nd Amendment rights! Use this handy tool to locate shooting ranges in New York. Sort by distance from a particular zip code or by a list of amenities.